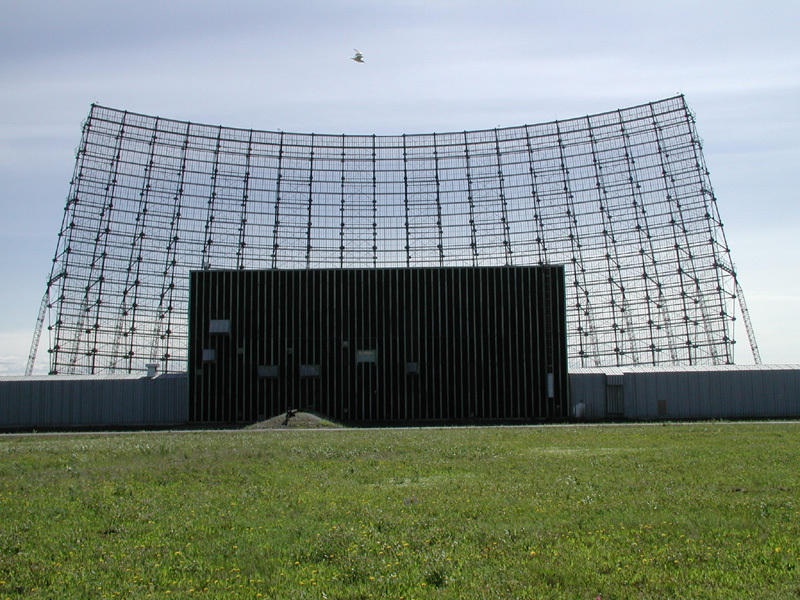 The AN/FPS-50 was a BMEWS program surveillance radar that used a large, fixed-antenna fence system, a so called Torus Antenna. Two beams were projected from the antenna array. Objects passing through the lower-angled beam provided initial data and warning for the North American Air Defense Command (NORAD). Data produced when the object passed through the upper beam allowed computation of trajectories on launch and target points. General Electric (GE), Heavy Military Electronics Department, installed these systems at Clear (Alaska) and Thule (Greenland), during the early 1960s. The prototype for the radar, designated the AN/FPS-50, was built by GE in Trinidad in February 1959, where it was used to support missile tests launched from the U.S. Atlantic Missile Range in Cape Canaveral. Lincoln Laboratory’s contributions were significant. They included the design and development of the high-power Organ-Pipe Scanner,,, Doppler filter banks, a data-processing computer bank, algorithms for target-threat characterization, and the specification and testing of many other radar components. Each AN/FPS-50 detection radar consists of three antennas and associated equipment which monitors three areas, each area is 40 degrees in azimuth, which providing a coverage of approximately 3,000 nautical miles in range. The Detection Radar antennas are 165-feet high by 400-feet long. The reflector is shaped parabolic in height, and circular in horizontal direction. They continuously watch a fixed area of space for missile launches and orbiting satellites. Each of the detecting radar antenna areas is repetitively scanned by radar beams at two elevation angles. The upper radar fans radiate at 7-degree elevation and the lower radar fans at 3.5-degree elevation. The transmitters used six pairs of 18 inch diameter klystron tubes, manufactured by Litton Corp., mounted in oil-filled transformers and extending up through the main floor some 10 feet. Each klystron tube in UHF range at 425 MHz would provide an average power of 2.5 megawatts. Each pair of these klystron tubes was joined by waveguide nearly a yard wide and 18 inches deep, big enough for a small adult to crawl through. These pairs of transmitter tubes were routed to waveguide switches which routed the radar energy out of the building to the scanners. The radar screen was an oscilloscope display with dual trace A-Scan, positively deflected upper trace, negatively deflected lower trace. The display sweep was deflected with a speed of 4 ms, 35 ms or 6 seconds. In 1971 the sites were modernised using the older torus antennas. Radar Set AN/FPS-50(V) is a high-power surveillance radar, operating in L-Band frequency range. Conventional ranging and pulse-Doppler techniques are used to determinate range, position and range rate of space objects. A major portion of the AN/FPS-50(V) is identified as the Radar Set Group. The Radar Set Group comprises equipment cabinets consoles, waveguide and coaxial rf propagation components and auxiliary units. Equipment of the Radar Set Groups is located in three transmitter buildings at Site 1 and two transmitter buildings at Site 2 of the BMEWS. Most items of the Radar Set Group are housed in electronic equipment cabinets which are of a standard size and wich are used throughout Radar Set AN/FPS-50(V). These cabinets are 83" high, 28" long and 30" wide.